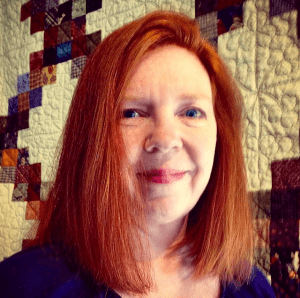 5 Tips for a Fantastic Sewing Day - Use these tips to plan yours now! There’s nothing better than a day spent sewing! Ok, there are a few things but you know what I mean. When I’m over committed and running like a crazy woman taking care of work, home and all that goes along with those items I can’t help but dream of a day spent sewing. We all need a little fun every now and then but not everyone wants to sew. For my hubby, it would be a day spent fishing or time with our family. What would it be for you? Whether it’s a weekend away or a trip to spa for a mani pedi it’s important we take that time for ourselves. Let’s get started. #1 Put it on the calendar! It can’t be moved or canceled unless someone is seriously ill or you’ve won a trip for 2 to Maui! It doesn’t matter what day of the week it is if you can clear it! Whether you plan ahead or it’s last minute it’s sure to be a terrific day! 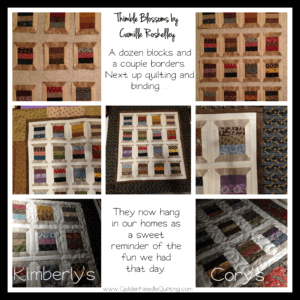 #2 Invite a quilt friend! Life is so busy and you can bet if you aren’t taking time for yourself your quilt friends probably aren’t either. Invite someone to come sew the day away with you. You’ll be glad you did! #3 Plan your project ahead of time. If you can squeeze a few minutes here and there to prep ahead of time it’ll make the day that much better. Whether you start something new or work on a UFO you can hit the ground running when your sewing day arrives. #4 Tidy up. I don’t know about you but my creativity is zapped when the house needs my attention. So, I make sure to get caught up (or close to it) the day before so that my sewing day is spent sewing rather than crossing things off the to do list. #5 Plan Dinner. I like to put dinner in the crock pot so I don’t have to stop sewing until dinner time. Whether you’ll be utilizing the Crock Pot, the Instant Pot, the BBQ or pizza delivery if you’ve planned ahead of time you’ll end up with more time to sew and dinner will still be ready when your tummy starts growling. That’s a win-win in my book. #5 Turn up the music and sew! Whatever your favorite genre is turn it up to your liking. Whether I am sewing alone or sewing with a quilt buddy with background music there’s something about music that soothes my weary soul. For those around when I do so and start humming or singing along…. I’m sorry! My latest sewing day was with my friend Cory. She came up with a great little project we could do together. We always have so much fun!. Sometimes it seems we talk more than we sew but it’s ALWAYS a great day! 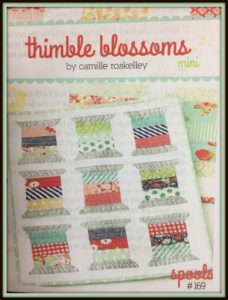 Cory brought Spools by Camille Roskelley of Thimble Blossoms. It was the perfect pattern for a sewing play day. We decided to dip into our Civil War collection and utilized quite a few scraps from previous projects. The only problem we had was narrowing down what prints we wanted to include. We ended up making 16 blocks instead of 9 so that we could use more of them. What tips do you have for a fantastic sewing day? Whatever they are, get your calendar and block out a day before another month passes you by! I’d love to hear how your day goes and see what you worked on.